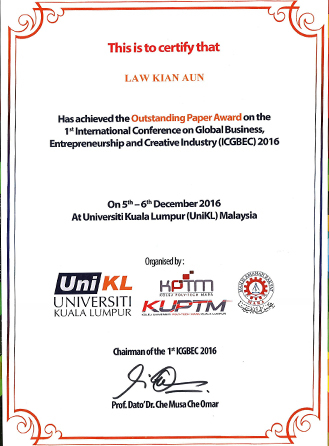 UTAR Faculty of Accountancy and Management’s (FAM) Assoc Professor Dr Law Kian Aun was endowed with Outstanding Paper Award in the 1st International Conference on Global Business, Entrepreneurship, and Creative Industry (ICGBEC) which was held at Bestari Hall, University Kuala Lumpur (UniKL) City Campus on 5 and 6 December 2016. The international conference was jointly organised by University Kuala Lumpur (UniKL) and University College Poly –Tech MARA (KUPTM). Bearing the theme, “Prospect and Challenges”, the conference brought together many academicians, researchers, practitioners, professionals and students to share their topics of interest in the fields of theoretical, experimental, applied Entrepreneurship, Management and Business, and Creative Industry. This platform provided an excellent environment for the participants to enhance communication, exchange and cooperate in research pertaining to education and application in relevant fields. 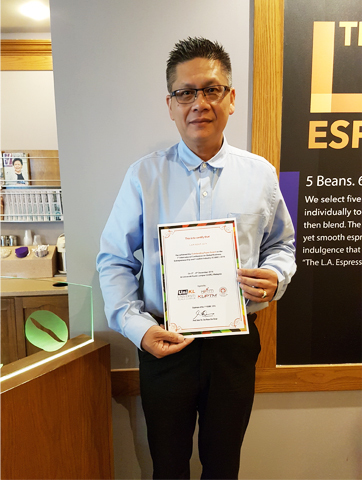 Dr Law’s paper titled, “A qualitative study on the perception of foreign medical tourist, on medical tourism in Malaysia”, which highlighted on medical tourists that travel to a particular country of choice to meet their medical needs, was awarded as the most Outstanding Paper at the conference. “In this study, the researcher mainly focused on Malaysia and examined how and why Malaysia was perceived as one of the preferred medical tourism destination.The thematic codes were identified accordingly such as cost, service quality and logistics whereas the trustworthiness was determined by methods such as credibility, transferability, dependability, and confirmability. The credibility was further established by prolonged engagement with the medical tourist to build trust and persistent observation on their expression. Triangulation was also performed in the act of active observation and in-depth interview,” said Dr Law. Dr Law also extended his appreciation to his co-researchers, Asia Metropolitan University’s Faculty of Business Dr M. Jayakumar and Institute for Medical Research (IMR) Dr N. Tharmarajahfor their collaboration on the research paper.